The reggae band talks roots in church, the story behind their name & what's coming next. The Jamaica-born group aims for the heavens. September 12, 2018 | Royal KhaoZ know a thing or two about, well, soothing the sometimes overwhelming chaos in the world. Through a bluesy fusion of traditional reggae music, combed from their early beginnings in Jamaica, and a more traditionally-slicked approach, the band -- made up of lead vocalist Jermaine Williams, Andre Hawthorne (on keyboard and also serving as producer), Kavi Forgie (bass, guitars), and Niel Brown (drums, percussion) -- the band offers a sublime message of unity and freedom. "No revolution will be had without chaos, no change without disruption. From the crumbled standards and forms, a royal way of thinking will rise," reads the band's official bio, a thoughtful manifesto for these trying times. With their most recent project, 2016's rigorously potent Release the Pressure EP, Williams' voice is as a bird with an olive branch, weaving up into the clouds and through the sunlight's tender rays. Make no mistake, they do their fair share of brazen honesty and pointed criticism of the world. But it's all within the scope of compassion and reaching out a hand to their fellow man. 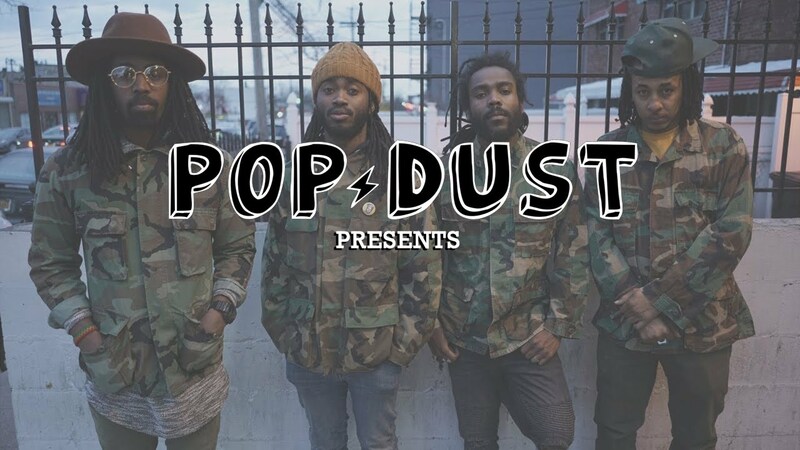 Earlier this month, the band stopped by the Popdust studio to hang with consummate host Deascent. The quartet discussed early roots in the church, the meaning behind their band name, how their latest EP came to be, and what's coming next in the pipeline. Watch the interview above. Now all New York City staples on the local scene, hustling and bustling to their own tune, Royal KhaoZ officially founded themselves as a collective back in 2010. Over the course of eight years, they've grown tighter and stronger together had have released one other project, 2012's full-length debut record, aptly titled Life: The Journey. In addition to showing remarkable force on various stages around the booming metropolis on their own gigs, they've shared stages with the likes of such musical giants as Toots & The Maytals, Sister Nancy, The Wailers, Luciano, Third World, dancehall's Kranium, Yellowman, roots percussionist of Chronixx, and the Zincfence Redemption. In creating such a lush and full sound, they've managed to cement their own kind of legacy, one built on recharging the craft with a bit of energy and heart. Essential cuts like "Roots" dazzle in coolness, allowing the composition to float on the breeze with loose weight, and "Jam Rock and Roll," which hits a bit harder, blending in frothy tones of ska music, a late '50s style of music, the precursor to traditional reggae and rocksteady. Regardless of the proliferation of styles, the outfit is a chameleon and slithers effortlessly within and between varied vocal phrasing, production elements, and playing. The band is currently hard at work on a new collection of songs. Stay tuned!